other than with conventional art galleries - have changed over time. - and how to avoid scams and keep control on what it costs you. The Artist-run Gallery - for those artists who want to co-operate to exhibit and sell art - without the involvement of a commercial or public art gallery. Banner Image: Gallery Hire - See Rosa Sepple sells 50+ paintings in 4 days! at The Threadneedle Space at the Mall Galleries for a joint exhibition. ​See A Threadneedle Space Exhibition for how the arrangement worked. There are a lot of people who make a business out of exploiting those who would like to make a success out of being an artist. There are a lot of people who have a bright idea but lack the competence to deliver what they'd like to do. The art market is a target for financial crime. It pays to do some research about reputation if you don't want to be associated with any art fair or people who have sold stolen goods in the past. Before making any financial commitment - to a gallery or an art fair or any other event - make sure you ask some questions to find out whether or not you might be wasting your money and/or damaging your reputation. Due diligence is an investigation of a business or person prior to signing a contract, or an act with a certain standard of care. It can be a legal obligation, but the term will more commonly apply to voluntary investigations. the relative opacity of the art market makes it a significant target of financial crimes. 10 questions for artists to ask event organisers - These are the questions to consider if you're invited to participate in an event - an exhibition or fair - which aims to have artists with stands displaying their work. cost to the artist: Best return if exhibition generates good sales. No commission paid. risk to the artist: Maximum effort cost and risk if no sales. Gross sales have to fund all expenses of rental and marketing. cost to the artist: often a combination of membership subscription and time spent doing stewarding/processing sales. No commission costs. business model: income derived from artists paying fees to exhibit their work (often seen as deception / a scam as galleries can masquerade as proper art galleries). Marketing targets inexperienced artists. Paying for your own marketing used to be really frowned on - but times have changed. Today, marketing art is no longer limited to the conventional and traditional methods e.g. bricks and mortar galleries. the closure of a lot of art galleries due to economic difficulties and a failure to get to grips with the internet. Many artists were 'stung' as galleries closed. Some were left with their artwork behind locked doors and a closed sign. The critical difference with Self-Promotion is that the artist is in charge - and is not being taken advantage of. Many artists have explored ways of making themselves more independent of conventional channels. 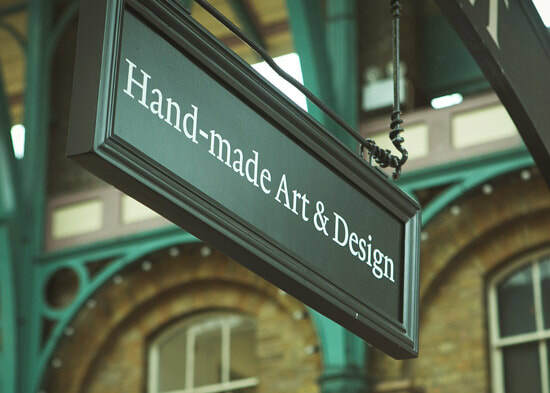 Beside promoting themselves - via websites, blogs, ecommerce and holding open studios - one of the ways they can promote their art is to hire space at a reputable art fair/market or gallery and hold an exhibition. running your own Gallery alongside your studio. Such exhibitions can be very successful - and very profitable for an artist with a strong following who knows what it takes to make an exhibition successful. They can also be very high risk and make a big loss if the artist does not have an existing following and/or does not make a significant effort to market their exhibition effectively beforehand. Two galleries in London that hire space to reputable art groups and artists are the Mall Galleries, the Bankside Gallery and the Menier Gallery. The first two are homes to prestigious National Art Societies and artists renting space are often members of the art societies. The Menier Gallery also has art society exhibitions by those not associated with either of the first two galleries. Pop up shops are temporary retail spaces, used by tenants who need a short, flexible hire instead of a traditional long lease. Vacant high street shops provide space to test an idea, launch a business or product, reach new customers and build brand awareness. It can also help a local community and economy by providing an attractive use for an otherwise empty shop or commercial space. You can use vacant commercial premises on very flexible terms. .....and then you need to locate a suitable space in a suitable place. Examples of Pop Ups - take a peek - you may get some inspiration. The Storefront - a website which helps you find the ideal space in the USA and talk to the people who can help you to use it​. This is how it works. This book was written by the Empty Shops Network founder Dan Thompson and published in 2012.